Peru. Iquitos is a town isolated in the middle of the jungle at the turn of the century. On the outskirts, a few shacks are rotting in the mud. In the centre are the splendid houses of the nouveaux-riches rubber barons. It is in this setting, rich in grotesque contrast, that Brian Sweeney Fitzgerald – Fitzcarraldo, as the natives call him – has his dream of bringing together Enrico Caruso and Sarah Bernhardt for one great celebration of Grand Opera. To finance his fantastic dream, Fitzcarraldo decides to exploit a vast area of rubber trees growing beyond the impassable Ucayala Falls. In oder to circumvent this barrier, he really did have his huge steamboat lifted over a mountain from one branch of the river to the other. 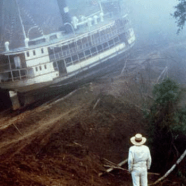 With the aid of a tribe of Indians bewitched by records featuring the voice of the greatest singer of all time, Fitzcarraldo fights fever, mosquitos and suffocating heat to achieve the impossible . . .